This article explains the process of developing lexer for lexical analysis of source code. 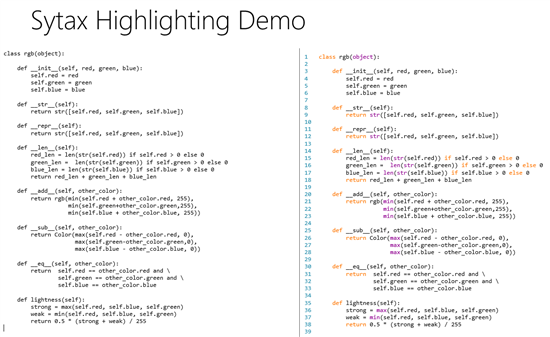 Using tokens generated by lexer, one can be able to syntax highlight source code. In this article, I'm developing lexer for Python Programming Language. However with little change in Regular Expression, other programming languages can also be scanned. Throughout the article it will be considered that you have knowledge of Regular Expressions. Lexical analysis is a process that converts sequence of characters or source code into meaning-full character strings i.e Token. Lexical analysis is performed by Compilers and Syntax Editors. Lexical analysis is also known as Scanner, Tokenizer or Lexer. Working of lexer is quite simple can be implemented using Regular Expression. To improve performance of this loop, there must be less code under the covers. On each iteration of loop we are going to match string against some rules and on match we will increment i by length of match. Before continuing let's first implement some important types. Token Type is an enumeration containing all the possible tokens types. All the tokens generated by lexer must be of any type from enumeration. Let's define some general Token Types. Token is a sequence meaningful characters. Each token has a specific TokenType associated with it. Instead of copying captured string value to token, best practice is to store start index of captured string in source string and length of captured string. Let's implement Token. Lexical rule contains pattern to search in source string. Each lexical rule contains some additional information about search pattern. In our case we are going to store only TokenType for each lexical rule. Search pattern is defined in regular language consisting of regular expressions. Let's implement Lexical rule. Lexial rules must be mutually exclusive i.e it can capture all the characters in the string. You can think off adding a LexicalRule at the end with pattern ^. this will match any character and prevents infinite loop of tokenizer. Lexical rules pattern must not capture string of length zero. If there is such pattern that matches string of length zero then again an infinte loop in tokenizer. Lexical rules much capture string from start. For this simple add ^ before pattern that will tell regular expression engine to match from start only. Lexical rules is the key part of a lexer. Changing these rules can changes the lexer targeted programming language. Let's define rules for general token types defined earlier. 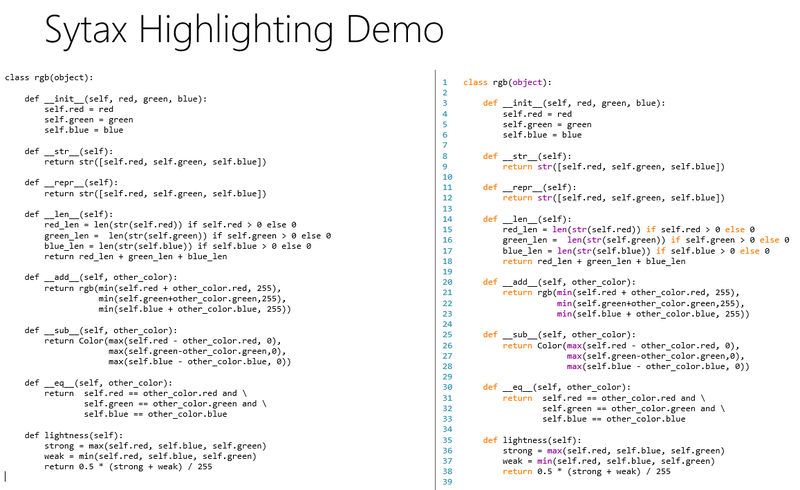 Below is the snapshot of demo syntax highlighter for python programming language.